I love a party and I love blog parties even more so I have decided to host my very own. 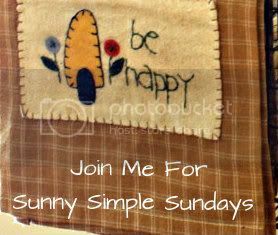 Your are cordially invited to join me each Sunday for SUNNY SIMPLE SUNDAYS. will be the rule. Just post whatever you have been up to or share your latest post or just a nice link to your blog. I am making this simple. Come in your jammies if you'd like. I will have the coffee on. sounds great! I'll join in for sure!!! FUN!!! I will be there!!!! I don't understand the linky stuff...how do I do it as I would like to participate but haven't a clue! LOL! Could you teach me before Sunday? LOL! Sounds fun - fire up the Keurig. I like Donut House coffee! Sounds like fun, I'll see what I can do. Great! Count me in. Wishing you a lovely weekend. I am so excited! I love simplicity! Awe the simple things in life! Can't wait till Sunday!